The alarm clock rang, and the young woman rose from her four-poster bed. In a simple ensemble of ruffled shorts and a tank top, she stepped across her room and stretched, ready for the long day ahead. 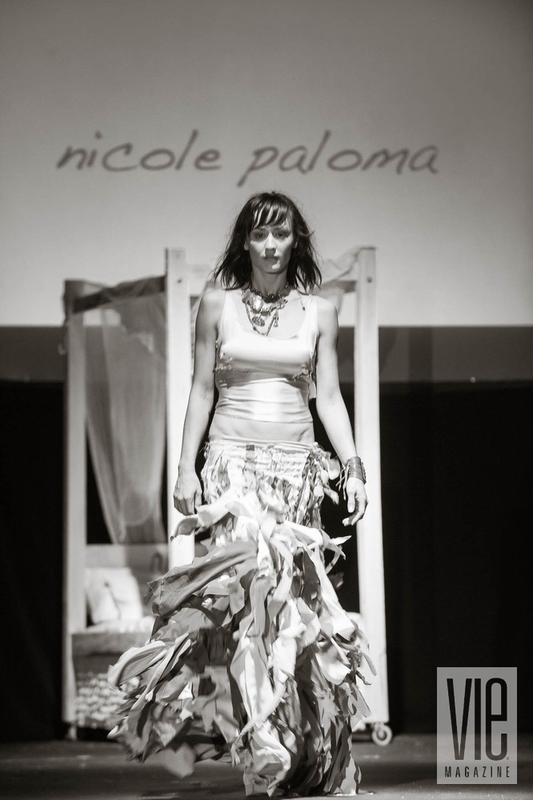 The Nicole Paloma presentation at South Walton Fashion Week on October 11, 2013, had the audience hooked from the moment the small wooden canopy bed was rolled onto the runway. Before the music even started, applause broke out—the runway show was already different from anything else the crowd had seen that night. And the rest of the show didn’t disappoint. Kristen Mitchell and Grace LaPerriere make up the rest of the Nicole Paloma team, along with Nicole’s mother, Marscha Cavaliere, who has sort of become the brand’s official photographer. In fact, Nicole Paloma has always been a family affair. Nicole bought her first sewing machine seven years ago, when she began making clothes for her daughters, Laurel and Laine. “I filled up their closets,” she admits. “I have a little bit of a fabric addiction, and I thought, ‘If I sell some of these, I can buy more fabric!’” The obsession only grew, and when the family moved to Walton County, Florida, Nicole decided to start her own business. But Marscha says she knew long before Nicole started her kids’ line that her daughter was going to be in fashion. At two, Nicole would spend an entire day trying on every article of clothing in her wardrobe. “Nothing else mattered but cookies and trying on those clothes,” Marscha says of Nicole. At four, Nicole graduated to cutting, making her first ensembles out of oversized T-shirts. “And she is a business person,” Marscha adds. “As much fun as she has creating, she has just as much fun on the bottom line—and that’s good, because I think that gene tends to skip a lot of creative types, like me.” She laughs. Nicole explained the necessity of continuing her women’s line in order to increase profits, since “you can only charge so much for kids’ clothes.” Her business savvy has obviously paid off; she has enjoyed a boom in popularity among the 30-A and South Walton communities in the past two years, and her smashing runway debut at South Walton Fashion Week is sure to drive even more business her way. feel comfortable but also like a rock star. The runway show was a huge hit with the fashion week audience, in part because of the jewelry and accessories on the models. Showing with Nicole’s couture collection were accessories from Adorn by Mary Kay Samouce, who uses vintage keys, chains, mirrors, and all kinds of other baubles to create one-of-a-kind pieces. Prior to the runway show, a photo shoot at A. Wickey Studio-Gallery in Seacrest Beach focused on the perfect pairings of the Adorn collection and Nicole’s clothing. The Adorn line is available at A. Wickey and at Nicole Paloma in Grayton Beach. “I love supporting other local artists,” Nicole says. And one thing is certain: Nicole won’t be on this journey alone. Her family and trusted team are behind her all the way. “There’s a team here that is flawless,” Marscha says. Nicole backs her up, saying, “I have the best team and I couldn’t do it without them. Kristen is like the right side of my body. I don’t know how she puts up with me.” She laughs. “I’m really going to start hitting everything hard and heavy this year,” Nicole says. 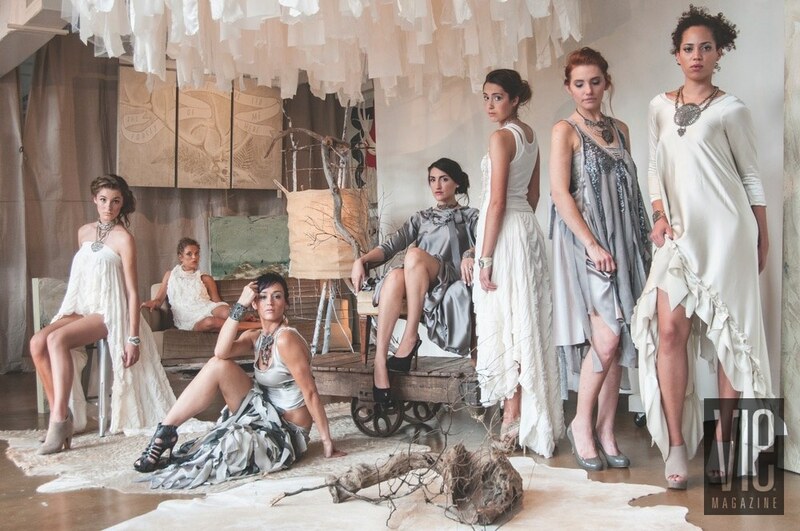 From the runways of South Walton Fashion Week to the runways of Paris? Who knows where she might end up—but her fans are excited to find out!